We did the research to find the companies that are making the best fishing reels right here in the USA. Check out our top recommendations below, along with a ton of details about each one, why we picked them, and the factors we considered in our research. If you haven’t yet, check out our research on fishing rods as well. During our research we came across a range of impressive reels made in the USA. Companies like Galvan Fly Reels, Aspen, and Lamson are making incredible reels for both fly fishing and spinning and casting. Overall, we found 10 brands that we think are making the highest quality reels, which we’ve highlighted below and separated out into a few different categories. We definitely found more fly reels than spinning reels – we’ll be sure to keep this page updated as we find other great options! Here are some deeper details about each one of our top picks, along with what we liked and didn’t like about each one. 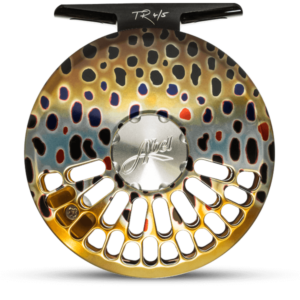 The Abel TR is a beautiful trout fishing fly reel and it’s one of our favorite reels for tackling midweight fish. This reel features a bright finish and precision machined parts that are crafted for reliable performance again and again. We love the light dragging sound when reeling in line using this reel, and how smoothly and evenly line is distributed while bringing it in very quickly. 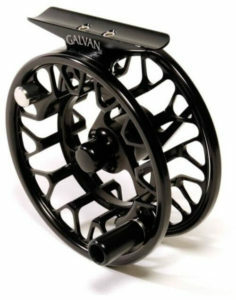 This reel is very lightweight and is comfortable enough for long-term use. This reel features a sealed drag system and operates very smoothly while needed minimal maintenance. It’s a quick action reel that’s ideal for trout fishing and fishing in fast-moving water. Made in Montrose, Colorado. 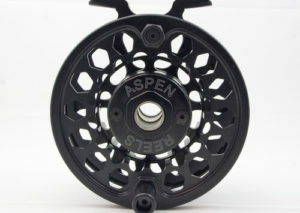 Aspen Reels is a well-known American company out of San Marcos, California that specializes in fly fishing reels. The Aspen 400 is a large arbor fishing reel that stands out because of its silky smooth and highly adjustable drag system. Get just the right amount of tension on your line while fishing, and bring in those massive catches with relative ease. The Aspen 400 features a sealed drag system that’s made from a mix of Teflon and stainless steel for nearly frictionless performance. It’s a good all-around reel and makes for an enjoyable fishing experience. The Ross Reels Evolution LTX is an impressive salt water fly fishing reel. It features a frame and spool that are both made from 6061-T6 aluminum alloy, making them resistant to corrosion over time, even when used in salty conditions. We were very impressed with how smoothly the drag system runs, and it features a stacked disc design that makes it durable enough to withstand the pull of some seriously big fish. The reel itself is very nice to look at with very thin machined pieces and a lightweight feel to it. It comes with an oiled bronze bushing that’s silky smooth to operate, and it’s available in black and platinum color finishes. Tibor Reels are world-renowned among fly-fishing enthusiasts for their excellent reliability and smooth functioning. 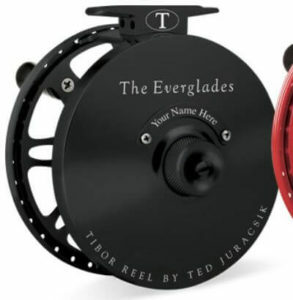 The Everglades is the smallest reel offered by Tibor, but arguably one of the most versatile and best all-around fly fishing reels that you can get your hands on today. 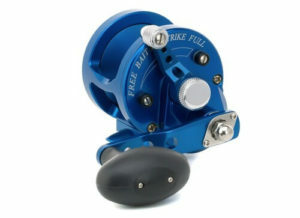 The reel maintains an excellent spool diameter and a wide bore for its smaller size. This makes line retrieval smooth and very rapid. The reel features mostly stainless steel internal parts and has a ceramic coated gear for maximum strength. We love that this reel features a one-piece spool and a waterproof spool cap. It’s a lightweight reel overall and very comfortable for extended use. Made in Delray Beach, Florida. We love the proprietary Click-Ball tension system that’s built into the Brookie reel. Tension can be adjusted with a few turns of an allen wrench, and once it’s adjusted it stays put. This makes it simple to fish at just the right level of tension for different conditions and makes the reel particularly valuable for trout fishing on fast moving water. The Brookie is designed from a 6061 aluminum housing and is near completely waterproof. 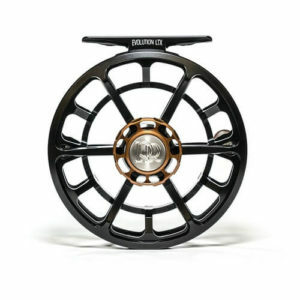 It features a nice machined finish that gets rid of excess weight while giving this fly reel a very cool appearance. The reel is available in four different weight options for 0 to 5 weight lines and it’s a versatile lightweight fishing companion that’s perfect to take out on a range of rivers and creeks around the world. The Hatch Outdoors 2 Plus Gen 2 Finatic is a versatile reel that’s designed to accommodate lines from 2 weight to 4 weight. It weighs just 3.2 ounces and has a reliable, though slightly touchy, stacked disc drag system. The drag system features a mix of Rulon and stainless steel rings stacked up and offers an impressive adjustment range for just the right amount of pressure in different fishing conditions. We love that the whole reel is CNC machined in Vista, California and how clean and professional the machining work is. The whole reel is protected by a Type 2 anodized coating and it stands up exceptionally well to moisture, dirt and grime. The reel is offered in four different color finishes and offers a great lightweight fishing experience. 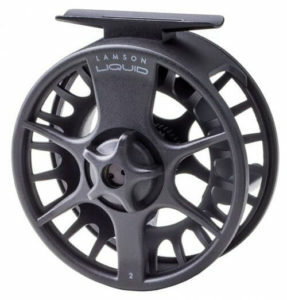 The Lamson Liquid Fly Fishing Reel is a testament to what you can accomplish with cast molding when you add in just the right amount of machining to finish off the process. This reel is exceptionally well-constructed with full radius compound curves and inside corners with very little radius at all. The whole frame and spool of this reel is composed of pressure-cast aluminum. This is one of the most affordable reels on our list (along with the Teton below), and still offers high-end performance thanks to some very good decisions by Lamson. The reel itself features a smooth conical drag system that’s completely sealed to keep it running smoothly over time. It’s offered in four different form-factors and can accept between 100 and 250 yards of backing depending on the reel model that you choose. Overall, this is an excellent fly fishing reel that shows what cast building can offer, and it’s surprisingly affordable for its quality level. 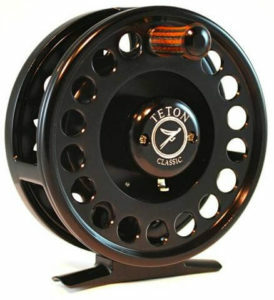 The Teton Classic reel is one of the highest quality and most affordable reels we’ve reviewed. The reel is made from machined aluminum and built from thick material that’s durable and meant to withstand corrosion effectively. It’s designed for use in salt water or fresh water conditions and features a sealed drag system that should be relatively maintenance free. We love the smooth feel of the epoxy-coated Dymond wood retrieve handle and it has a classy appearance that’s hard to ignore. The fixed circle drag system on this reel runs smooth, but the whole reel does exhibit slight chattering when the drag is adjusted to low enough levels. Overall, the reel is a joy to use, it’s durable and built to offer excellent fishing conditions at a reasonable cost. Enjoy smooth and even casting conditions with the Avet MX reels. These reels feature a lightweight spool that’s narrow for fast casting and retrieving. The whole reel is made with one-piece construction and we love that it’s composed of a mix of 6061-T6 marine-grade aluminum and stainless steel. It’s equipped with steel gears for durability and has an incredibly smooth reel thanks to the eight built-in ball bearings. This reel is 100% made in the USA (in Chatsworth, CA) and features a convenient alarm clicker for those moments when you look away. We were impressed with the comfort and casting power provided by the IRT line of spinning reels, which are made in Pine Grove, Pennsylvania. These reels are carefully designed to make them as comfortable as possible when reeling the line in. 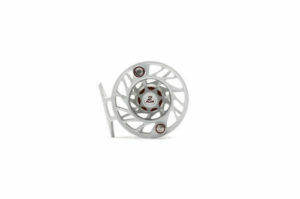 The IRT spinning reels all come outfitted with aluminum machined spools that are known for their symmetrical line wrap. This offers smooth casting, drag, and line performance compared to other reels. Each reel features the patented Spin Power Grip, that alleviates common pressure points during reeling for enhanced comfort. 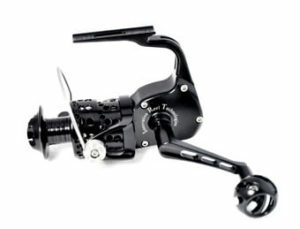 The reel also features a longer lever arm for enhanced casting capabilities. These reels operate smoothly with a total of 9 ball bearings in action at the same time during standard use. They are made from machined aluminum and hold up well to corrosion. They also feature a reversible handle for left or right-handed fishermen, which is a nice touch. These reels are some of the best spinning reels that we’ve had a chance to test, and a good all-around fishing companion. We had the chance to hear from Greg Header, President at IRT Reels, who spoke about why they choose to manufacture their reels in America: “IRT chooses to make its reels right here in the U.S., not only because we take pride in being American, but also because we care about creating American-made jobs. We want to use our grassroots beginnings to provide top-quality service to fellow Americans and bring customers the best products possible. With our patented technology and constant desire to improve through customer feedback, we truly aim to capture the American spirit. IRT takes pride in being the best that we can be, all while helping our customers and team achieve their full potential in the sport.” Inspiring words. It’s companies like IRT Reels that keep us incredibly excited about the future of American manufacturing. Choosing the right reel starts with looking for quality materials. We look for reels made from stainless steel, aerospace-grade aluminum, and carbon fiber. When looking at gears we look for steel or stainless steel for longevity. Quality materials don’t mean much if they aren’t built well. While we only recommend reels made from high grade materials like carbon fiber, marine-grade aluminum, and stainless steel, we examined each reel closely to verify that the cast-construction or CNC machining is nearly flawless. The reel must fit together with precision to function properly and that’s something we considered carefully. Even well-constructed reels won’t necessarily hold up over time if they weren’t designed properly. While comparing reels we look for wide bore design, sealed bearing and drag systems, reliable joining methods, and long-lasting gear designs to make sure we’re recommending reels that are going to last for years. No matter how tough a fishing reel is, it needs to be enjoyable to use. That’s why we paid close attention to things like drag adjustment, cast smoothness, comfort, and reliability when testing out different reels.